Encoder feedback is essential to the performance of many automation applications. Properly specified, an encoder will deliver the results needed to support effective positioning at a price that suits the budget. Improperly specified, it can degrade system performance. To understand how and why, we need to discuss the concepts of accuracy, resolution, and repeatability as they apply to encoders. Encoder resolution is the number of measuring segments or units in one revolution of an encoder shaft or 1 in/mm of a linear scale. Encoder resolution is commonly measured in pulses per revolution (PPR) for incremental encoders and bits for absolute encoders. An encoder pulse refers to the smallest segment of a given physical quantity that the encoder can measure or display. In other words, it is the granularity with which the encoder can monitor the equipment. On an optical encoder code disk, the more densely scribed the pattern, the higher the resolution. Rotary encoders are available with resolution of up to 10,000 pulses per revolution (PPR) directly and 40,000 PPR via interpolation. Linear scales offer resolutions on the order of microns. A common misunderstanding regarding encoders is to assume that a higher resolution improves the accuracy of the system as a whole. It is important to note that increasing resolution will not compensate for the latter type of error (see figure 1). Adding more pulses per revolution may improve the ability of the encoder to report position but if there is a systemic error, higher resolution will not correct it. The two examples above have the exact same resolution (24 counts) but dramatically different accuracy. This is an example of how high resolution cannot improve accuracy. Encoder accuracy is a measure of the error between the value read out by the encoder and the actual physical value being measured. Encoder accuracy is measured in arcminutes or arcseconds with 20 arcminutes (0.3 degrees) or better generally considered a high accuracy encoder with some precision devices on the order of 5 arcseconds (0.0014 degrees). The accuracy of an encoder reading can be degraded by multiple error sources. One of those sources can be the encoder itself. 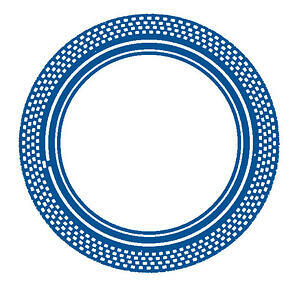 The widths of the lines on the optical encoder disk can vary, for example. This might introduce a small error in the timing of the pulses generated by the encoder. If the amount of error is known, it can be calibrated out by the controller. One method of finding the error is to use an external high precision encoder to measure the amount of error, recalibrate and then remove the precision encoder so that the system can function at a higher degree of accuracy than before. In other instances, error stems from the equipment being monitored. A gearbox might have backlash, or a lead screw might have play in its motion. It’s important to keep in mind that the encoder can only report on the position of the equipment it is monitoring. If there is a mechanical error, the encoder cannot improve performance. The third key characteristic of encoders is repeatability. Repeatability is a measure of how consistently the system can return to the same commanded position. 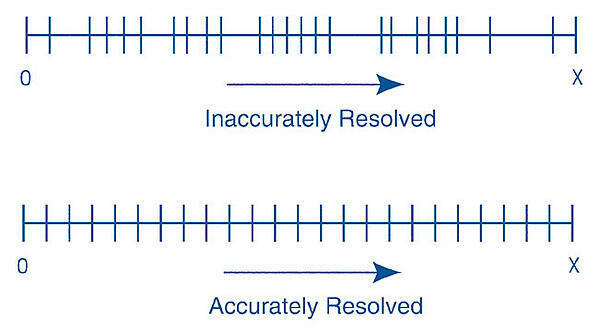 For encoders, repeatability typically would be 2-10 times better than accuracy. Like accuracy, repeatability has error contributions from multiple sources, which include the encoder and the equipment being positioned. Although certain types of encoders such as capacitive encoders suffer from cumulative error that builds up over multiple cycles, that is the exception rather than the rule. The most common encoder types used for automation, such as optical and magnetic encoders, are designed to prevent cumulative error. System repeatability can be reduced by mechanical errors in the system that can include gearing backlash, hysteresis, improperly tensioned belts, etc. As with resolution, users frequently assume that buying an encoder with very high repeatability will give the best results. That is not the case. Even an encoder with near perfect repeatability cannot improve on a system with poor mechanical repeatability. All the encoder can do is report. A system can have very high repeatability and remain inaccurate. Conversely, a system can demonstrate high accuracy but poor repeatability. Accuracy refers to the absolute positioning value whereas repeatability quantifies the ability of the system to repeat the same action to the same accuracy. High accuracy and high repeatability may seem ideal but the trade-off is high system cost and the application may not be that level of performance. Meanwhile, high repeatability may still not satisfy system needs if the application really emphasizes accuracy. Zero accuracy and a low repeatability generally do not serve any application. To optimize performance, system designers need to choose an encoder that offers the right mixture of accuracy, resolution, and repeatability. For a pick-and-place application, for example, the best choice may be an encoder that operates with moderate accuracy but very high repeatability. The accuracy error of the encoder can be calibrated out, while the repeatability ensures that the robot arm will go to the same position each time. A cut-to-length application might benefit from high accuracy but only modest repeatability.